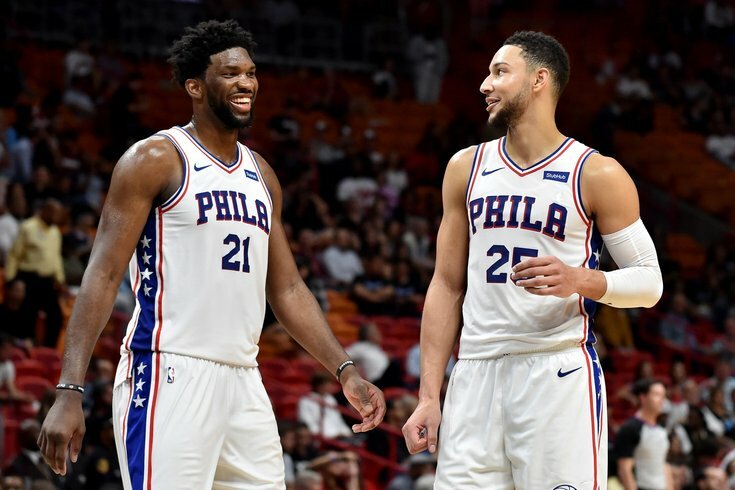 Philadelphia 76ers center Joel Embiid laughs with Philadelphia 76ers guard Ben Simmons during the second half Miami Heat at American Airlines Arena. The NBA held its All-Star Draft for this year’s All-Star Game in Charlotte on Thursday night, just hours after the league’s trade deadline madness. The Sixers’ pair of All-Stars — second-timer Joel Embiid and first-timer Ben Simmons — were initially on the same team, Team Giannis, which seemed fitting since LeBron spurned the Sixers this summer. But, as it turns out, that won't be the case. Giannis picks Ben Simmons as his third reserve (fifth reserve overall). One more take: putting Giannis and Joel Embiid, the fourth-overall pick, on the same team probably breaks some sort of Basketball Geneva Conventions with regards to collective wingspans. It's nuts. Now that teams are set... who are you taking?